Yesterday I gave a talk about OpenStreetMap at BeingOpen. And here’s a blurry picture of me talking Can you tell I’m really trying not to wave my hands around? 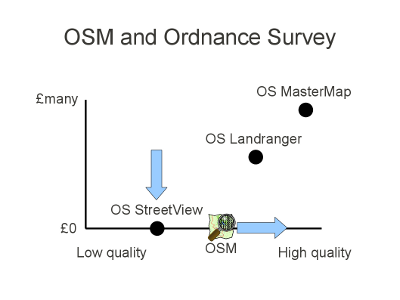 I always imagine my slide decks will be quite re-usable, but things change a lot in OpenStreetMap. My normal intro to the project needed updating to feature Potlatch 2 and a stats update of course. For eye-candy uses of OpenStreetMap there are a few nice new examples. 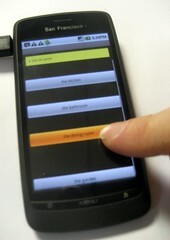 Many of these are nice looking mobile apps, and I was pleased to be able to sneak in a plug for placr’s UK TravelOptions app. The other things I added were Skobbler, and the new glosm 3D engine. But besides the normal intro, I tried to talk in broad terms about business aspects of OpenStreetMap. This is a classic graphic copied from Steve Coast, which I think explains the disruptive impact of OpenStreetMap very well. They definitely have not released all their datasets for free. The popular “Landranger” maps? Still charged for. “MasterMap” is the super-detailed dataset which you still pay through the nose for as part of the planning process. OSM isn’t really trying to reach the level of detail of MasterMap, but may perhaps exert a downward pressure on its price point. 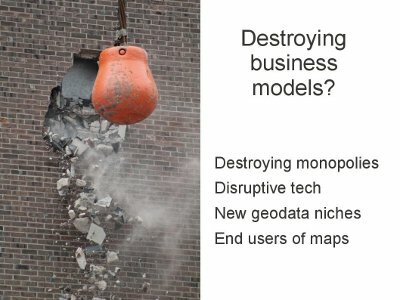 So in a way OpenStreetMap (and other open data initiatives) are all about destroying business models. 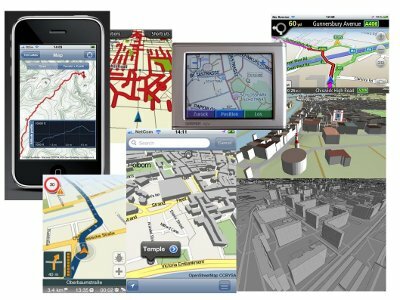 Traditional map providers have enjoyed a great business model: Licensing their maps. OpenStreetMap is disruptive technology which swings a wrecking ball through these monopolies. But in the wake of this demolition, there are new geodata niches which are much more interesting. Small companies can get involved map service provision where previously they wouldn’t be able to afford data licensing fees. I’m not going to lie to you. Finding a money-making niche in this landscape is a challenge. The people that undoubtedly benefit are the “end users” of maps. 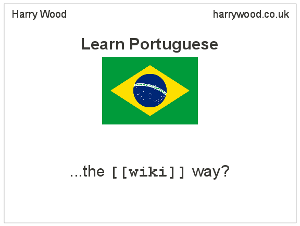 Businesses / website ideas which make use of maps tangentially to their core business model. These people have new and exciting map tools, and access to free data, thanks to OpenStreetMap. 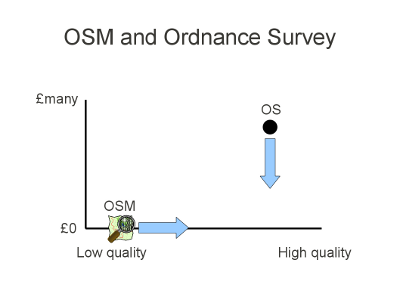 I followed up with some ideas for different levels of OpenStreetMap use, which I have described in more detail on the placr blog.